The hard truth is, progressing as a mixer does take time, but it doesn’t have to take YEARS. I’ve seen people improve dramatically within one mix using three principles I’ll share with you in this post. No one I know who mixes at a high level has ACTUALLY finished learning. After 25 years in the studio, I learn something new about mixing every time I get behind the console. The longer we mix, the more we solidify habits… good and bad. Your mixing can improve within days, or even hours, instead of years because of something called the 80/20 rule. The 80/20 rule was discovered by Wilfred Pareto, an Italian scientist, who observed that 80% of the land in Italy was owned by 20% of the population. After closer study, he (and later the scientific community) concluded there was a law in place. That law? 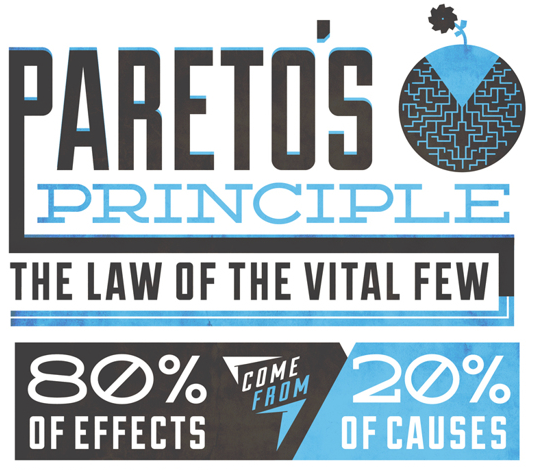 The Pareto Principle (a.k.a. 80/20 rule). 80% of your improvement will come from 20% of your efforts. 80% of your frustrations come from 20% of your mistakes. When you’re starting out in mixing, it helps to see progress and see it quickly. So, as promised, here’s three principles that when applied only take 20% of effort but yield 80% improvement. Find a reference that inspires YOU. Listen to mixers who are killing it and try to emulate what they are doing. If you’re asking, “Why would I want to copy another mixer’s epic mix?” my answer is, “Why in the world would you want to reinvent the wheel?” At this stage, identify what’s working instead of trying to improve mixing as an art and science. Don’t let your ego say, “I have to create my own way of compressing!” Start by doing it the way everyone else does it… at least for now. Don’t worry, you’re not plagiarizing their mix. Truth is, they’re doing so many “little” things that you could easily spend the rest of your life trying to emulate them all. But again 80/20 rule, remember? NOTE: Usually, the mix you will be referencing will have already been mastered. Keep that in mind. You will drive yourself crazy trying to get that kind gain out of your mix. Leave that to the mastering engineer if there is one or leave the final volume for later. For now, just turn their mix (the reference mix) down by about 3 db. Then, listen to key points in comparison to your mix. Is their snare fuller? Is it brighter? Where does the vocal sit? Is the bass louder or softer? How do the mixes compare at softer control room volumes? How does your mix and theirs sound in mono? Start with the big picture and then later, start zoning in on subtle vocal/ drum/ bass treatment. IS REFERENCING A MIX REALLY COPYING? I’ve heard it said that copying from one source is plagiarism, while copying from multiple sources is research. So do your research, it will only make you better. How will you know how far you’ve come or how far you have to go without a reference to shoot for? The famous archer, Howard Hill won all of the 267 archery contests he entered. He could hit a bullseye at 50 feet, then split first arrow with the second. Would it be possible for you to shoot better than him? YES, if he were blindfolded. How can you hit a target you can’t see? Even worse, how can you hit a target you don’t even have? You need to have GOALS in your life. When you are influenced by a mix try to emulate it. Think of it as setting a goal for yourself. 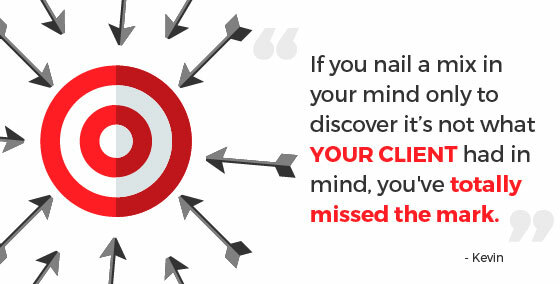 Find a reference that inspires YOUR CLIENT. It’s very important that when you are mixing for someone else (your band, a producer, a record company, etc. ) that you know what inspires them too. Before starting to mix their song, make sure you know what they want. If you nail a mix in your mind only to discover it’s not what THEY had in mind, you’ve totally missed the mark. 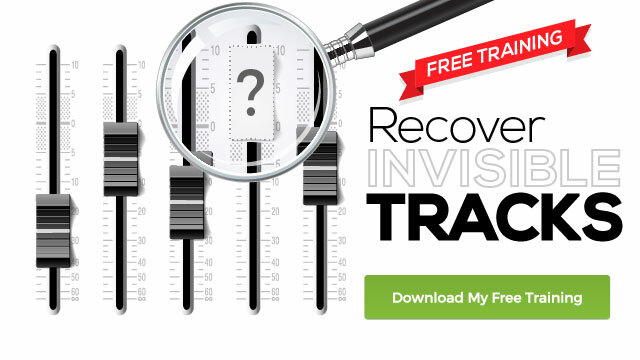 Principle #2: Recover Invisible Tracks: Don’t Forget Your Phase. Your snare sounds flat in the mix so you push it a little, but nothing. You solo it and magically it sounds FAT… even amazing! You put it back in the mix only to have it disappear again. The other day a student wanted to know what compressor to use on a snare to give it more punch. I asked him for a little more information. Come to find out he had 3 snare tracks, the live snare plus two snare samples. Isolated, each one sounded huge, but in context, left him craving more punch… even after 2 extra samples. What’s the deal? By all rights, that track combo should have been super-fat! Well, one or more of the snares was out of phase with the overheads. What a simple fix that led to huge results! There are not many plugins that can fix phase problems! Have you ever wondered how those classic rock or country recordings stand the test of time? Even today, those mixes still set the bar. The engineers didn’t have a list of plugins and triggers that would magically fix anemic drums. That’s because their “fixes” were more core and basic. There were several basic practices that they used that we tend to overlook in modern recording. The first of which is phase. Is your mix sounding a little flat? 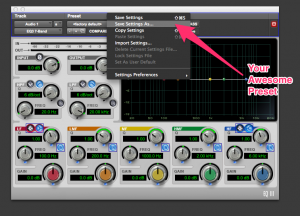 Download this free mini-training and learn how to quickly identify if phase issues are crippling your mix and how to correct them. Get it here. 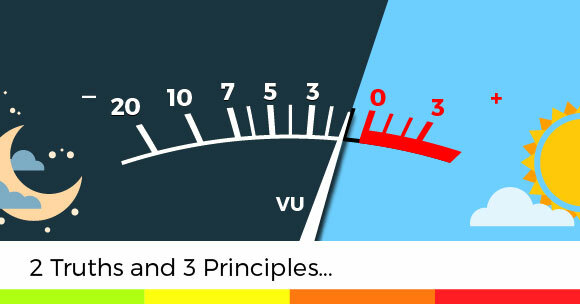 Principle #3: Mixes Aren’t Biscuits: Don’t Start From Scratch. Whether your session comes from MixcoachMember.com or some other source, save yourself a TON of time and promise me you won’t start your mix from scratch. Leave the 80% of your work to these presets and templates. This will free up the biggest part of your creative brain to make improvements that make up the other 20%. Either way, you won’t lose yourself in a mix next time by scrolling through a hundred factory presets. Sure, it may not work every time, but it probably will 80% of the time (see the pattern here?). Example 2: I personally route all my drums to an aux named, “Drum Buss.” Then I put my go-to compressor on that aux because I know it well and it sounds great. In a similar fashion, I always route my vocals using this type of chain. It saves me tons of time and allows me to start with a set-up I’m very comfortable with. The best mixers I know use mix templates they’ve created over time and that work for them over 80% of the time (hey, this is a pattern for sure). Here’s my point. If you don’t have presets and templates, start creating them NOW…on the next mix… like today. You’ll thank me later.